There are two kinds of sun dried tomatoes dry-packed or packed in olive oil. Most commonly used tomato is plum, but you can try other varieties in various sizes and colours. You can preserve them like dried fruit or you can pack them in oil. There are many uses for sun-dried tomatoes such as salads, sauces, stews, soups, muffins or frittatas, but you can use them in just about any recipe that you would use a fresh tomato in. When you are using dry-packed tomatoes you should hydrate them in water to plump them up before use. 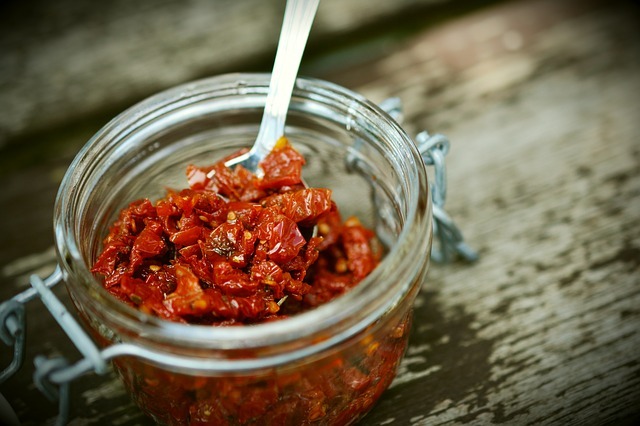 If you are using the sun-dried tomatoes packed in olive oil, drain the oil first and use the oil in other recipes. Here is our most popular gluten-free pasta salad recipe with sundried tomatoes.